North Jakarta Administration launches elderly health screening program in Koja and Lagoa Urban Villages. This service which is initiated by Koja Puskesmas is hoped to access all elderly in those two urban villages.
" 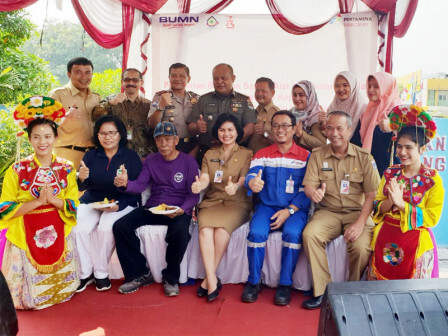 We hope this screening can optimize our work"
North Jakarta Assistant for Administration and Community Welfare, Wawan Budi Roham mentioned, Koja Puskesmas received health screening tools from one of national oil and gas companies through CSR. "We hope this assistance can help us to improve elderly health," he stated, Tuesday (7/31). Koja Puskesmas Head, Elysabeth E. Pandjaitan mentioned, current health service is only accessed by nine thousand elderly from around 22,311 total elderly in the area. "We have actively served around 41 percent. We hope this screening can optimize our work," she added. Through CSR, her side receives 10 packages of blood pressure monitors, scales, waist measuring tapes, blood glucose meter. Health screening is planned to be held in each RWs. According to her, health screening result will be taken as consideration for elderly health service. Registered elderly will be encouraged to have routine medical check via elderly posyandu. Up till now, there are 56 elderly posyandu units in Koja Sub-district with around 300 cadres. Her side will encourage to add more elderly posyandu to accommodate routine medical check for elderly. Besides posyandu, her side also cooperates with North Jakarta Youth and Sport Sub-dept. to hold water gymnastic for elderly at Rawa Badak Selatan GOR's pool. Currently 100 elders are actively joined class every Monday. "We target all elderly in Koja and especially in Lagoa to get access to health service," she conveyed.